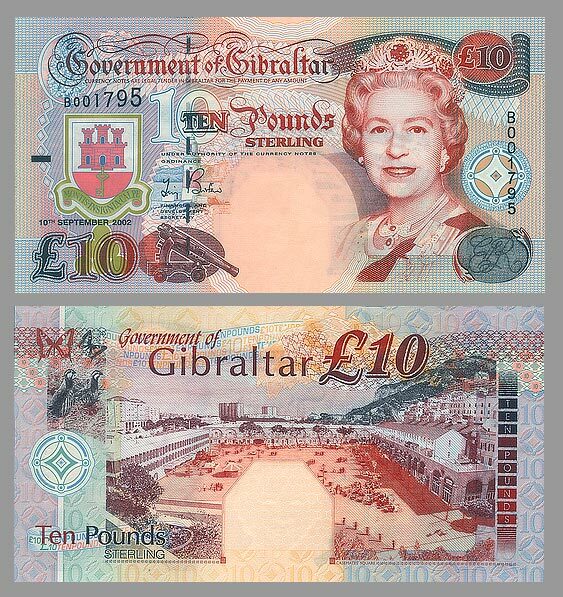 This £10 bank note was dated 10th September 2002, which is Gibraltar's National Day. On 10th September 1969 Gibraltarians voted to remain British, thus exercising self-determination. The date was selected as Gibraltar's National Day. The front of the bank note features the Koehler depression gun from the Great Siege and HM Queen Elizabeth II. The back of the bank note features an aerial view of Casemates Square, the focal point of National Day celebrations year after year and arguably the focal point of Gibraltarian society today. The Barbary Partridge and the Swallowtail butterflies appear on the bank note as well.